Deep insights into your custom .NET applications on IIS with Application Performance Monitor (APM). Understand .NET on IIS application performance—from web response time to tracing transaction flows. Pinpoint performance bottlenecks with powerful visualizations that can drill down to code-level insights. Monitor and troubleshoot application performance through integration with SolarWinds® Server & Application Monitor. Know your custom apps are performing properly without the need for deep instrumentation or configuration. In-depth, code-level monitoring of application performance and visualization of bottlenecks can help prove where and when end-user experiences do not meet designed-for service levels. 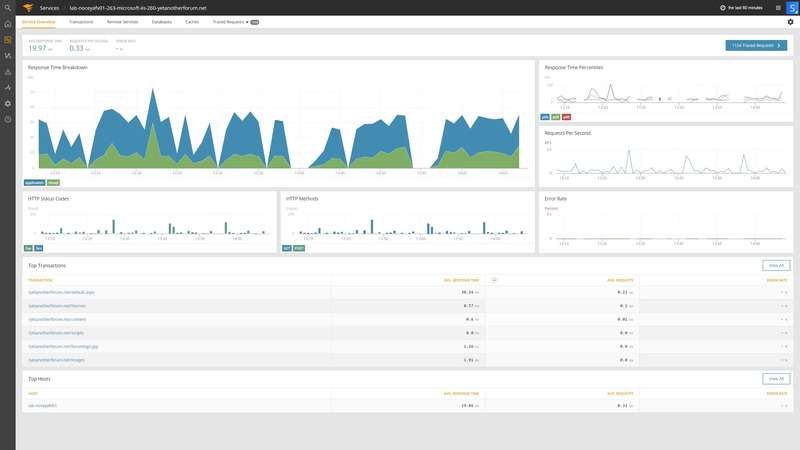 Deep application insights integrated into your SolarWinds Server & Application Monitor experience. Monitor the health and performance of your custom .NET applications alongside that of your other servers and applications, and drill down for deeper levels of performance detail. Monitor web request latency against number of requests and find outliers. Easily identify outliers across all your application web front ends, with the ability to filter and drill down into specific transactions. Monitor the performance of transactions for each managed .NET web application running on your IIS servers. Access detailed metrics on transaction performance, including response time, request volume, and error rate. Trace transaction flows through and across applications to help find the root cause of performance issues. Transaction traces help pinpoint the cause of performance issues, tracing the path of requests through your application, across RPC calls, through queries, and more. Gain the transaction trace details you need to help successfully discuss the problem with your application owners. Get to the specifics of the problem, with insights such as what database the application is calling and the exact query that was executed. Funktionsübersicht Deep insights into your custom .NET applications on IIS with Application Performance Monitor (APM). Do I need to have SolarWinds Server & Application Monitor (SAM) installed in order to use APM? What type of license does APM powered by AppOptics provide? What happens if I allow my annual subscription to expire? Will APM work if I am locked behind a network firewall? Does SolarWinds offer training or certification for the APM product? Although you don’t need to have SolarWinds® Server & Application Monitor in order to use APM, integrating APM with SAM can provide the best way to get visibility into both custom and off-the-shelf application performance. APM powered by AppOptics ™ provides a license to use the APM capabilities of AppOptics. It does not provide a license to use the full capabilities of AppOptics. APM users are not licensed to use the infrastructure monitoring or custom metrics capabilities of AppOptics. You’ll receive a notification 90 days prior to expiration to remind you that your subscription will be expiring. If you allow your subscription to expire, the agent will stop collecting data upon expiration. APM is SaaS-based, so an active subscription is required. APM is built as an easy, one-click install from the Orion® Platform interface. You’ll need to have access to the internet in order to connect and collect data. If you’re locked behind a network firewall, APM won’t work for your organization. The Success Center is your home for onboarding, training, new user information, the product knowledge base, and official product documentation to learn more about our server monitoring software. The Customer Portal is where you can submit a help desk ticket, find information about the products you own, and see available hotfixes and upgrades, as well as training opportunities for your products. The SolarWinds® Academy is a single location where you can find eLearning, as well as instructor-led classes, that will take you from the basics through optimization. We allow you to browse classes or, if you prefer, follow customized learning paths to keep you on the right track. SolarWinds solutions are rooted in our deep connection to our user base in the THWACK® online community. More than 150,000 registered members are here to solve problems, share technology and best practices, and directly contribute to our product development process. APM, or application performance monitoring, includes SaaS-delivered capabilities designed to provide deep monitoring of .NET on Microsoft IIS applications. APM can deliver down-to-the-code insights into application performance, visualization of performance bottlenecks, and helps prove where and when end-user experiences do not meet designed-for service levels.